Just a quick post before my daughter and I head out the door for a road trip to Mobile, Alabama with several stops on the way. I am beyond thrilled that my soon to be 14-year-old daughter wants to go anywhere with me. Her main motivation is to see friends in Alabama, and I am her means of getting there, but I’ll take what I can get. Our first stop is in Greenville, SC where if all goes as planned and we don’t have a heat stroke, we will bike ride the Swamp Rabbit Trail and stop for lunch in Travelers Rest. After we spend the day in Greenville, we will head to Atlanta for a day and then on to Mobile. Hopefully we have lots of adventures in store, all of them fun ones. Anyways, I have spent hours searching the internet for restaurants and things to do in the places we’ll be visiting and I haven’t had much time to cook. 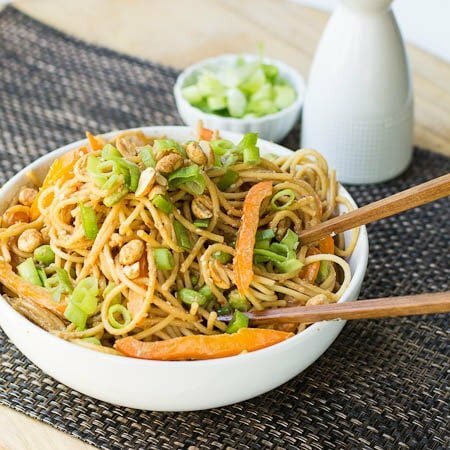 Peanut Sesame Noodles is a wonderful recipe for when you are short on time. 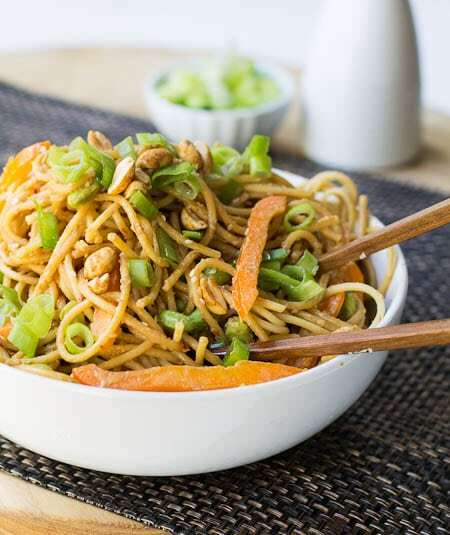 Bring some water to a boil while you throw all the ingredients for the sauce into a blender and chop a few veggies, boil the noodles and toss everything together. Cut back on the red pepper flakes if you don’t want it spicy. This is a meal the whole family will enjoy and it tastes good at room temperature or even chilled. Combine first 9 ingredients in a blender and blend until smooth. Place cooked spaghetti in a large bowl. Add green onion, yellow pepper, and edamame to bowl. Pour sauce into bowl and stir well to combine everything. Before serving top with peanuts. 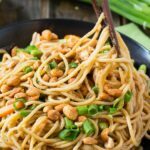 This entry was posted in Main Dishes and tagged kid friendly recipes, main dish, pasta, sesame noodles. Bookmark the permalink. This recipe has been bookmarked because I am *always* short on time! This looks fabulous! Let me know where you visit in Atlanta! So many good places to choose from! We didn’t have much time in Atlanta so we went to the Aquarium, World of Coke, and Centennial Park. Oh, and we had some wonderful doughnuts at Sublime Doughnuts! Can’t wait to go back. I eat pasta like crazy, but always tend to go italian. But I´ve been dying to try the peanut butter thing for the longest time, and just never do! This recipe is going to change that! So flavorful. 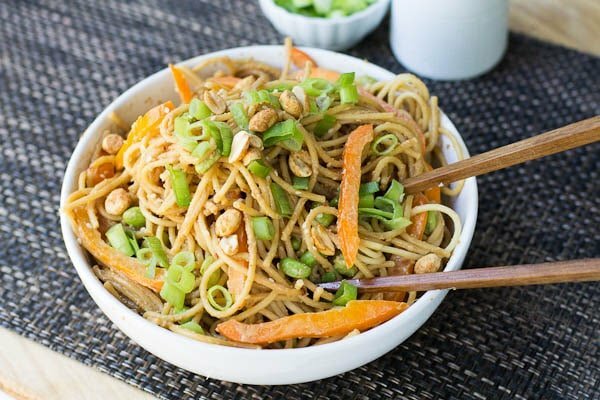 This looks delicious and sounds easy to make! I love those kind of meals. YUM! Oh yum!! !….please…can you come over and make it for me? Too delish – I can’t stand it!!! If I was evenly slightly adept at using chopsticks, I’d so be eating that right now. So cool that you and your daughter are going on a road trip! Have fun! 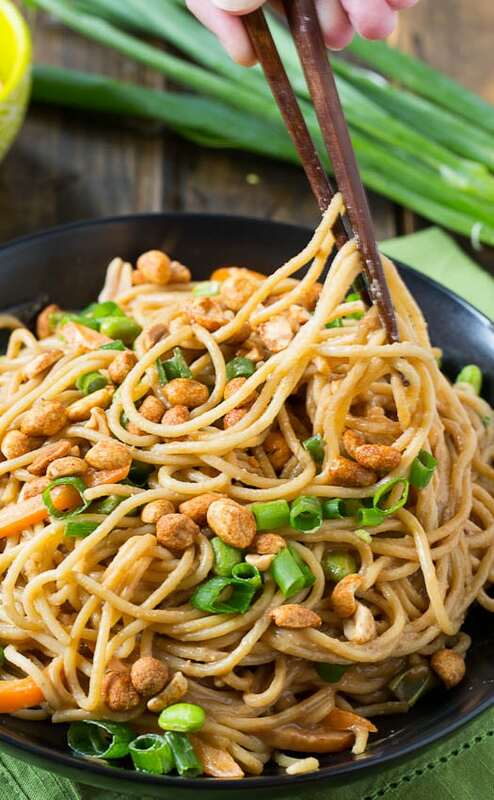 I keep wanting to try peanut noodles like this. They seem like the perfect summer dinner! Thanks Laura! Hopefully this is the first of many road trips. I am having a blast! 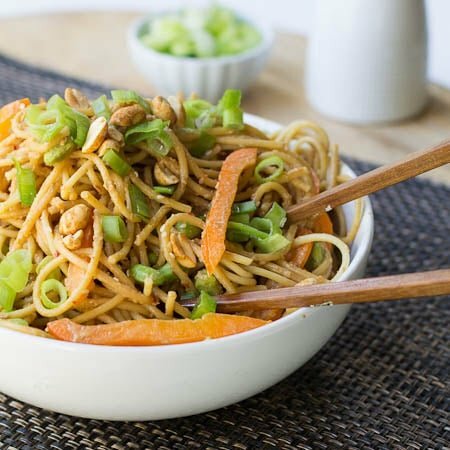 I love how this recipe is so simple but full of so many flavors. Have a great time on your roadtrip! Thanks Ashley! We are having a great time so far!